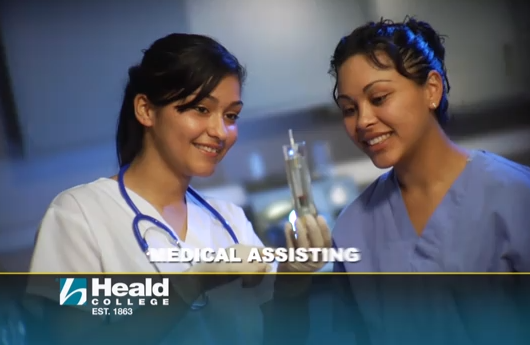 Heald College, along with Everest College and WyoTech, are all operated by CCI. California Attorney General Kamala Harris filed suit yesterday against a company that operates three for-profit colleges, alleging that it lied both to students about the prospects of job-placement, but also to investors about the success rate of its graduates. The complaint also accuses the colleges of illegally using military seals in its ads to lure in members of the armed services. The complaint [PDF] filed in a San Francisco court on Thursday, charges Corinthian Colleges, Inc. (CCI) and its subsidiaries that operate Everest, Heald and WyoTech colleges, for false and predatory advertising, intentional misrepresentations to students, securities fraud and unlawful use of military seals in advertisements. CCI operates 111 total campuses in North America and three online programs. California residents represent about one-third of the company’s 81,000 students. The schools then, through ads on shows like Jerry Springer and Maury Povich (Steve Wilkos isn’t mentioned in the complaint, but you know the ads run during his show too), CCI promises to turn these folks’ lives around, touting job placement rates as high as 100% for certain programs. However, says Harris, in some cases, there is no evidence that a single student obtained a job during the specified time frame. The complaint also accuses CCI of running ads about ultrasound, x-ray, radiology, and dialysis technician programs when the colleges don’t offer any of these programs. And when a prospective student contacts the school about one of these allegedly nonexistent offerings, the lawsuit claims that CCI call center employees are told not to reveal to the caller that these programs aren’t offered, or face discipline. CCI allegedly committed securities fraud, says Harris, when it reported a nationwide job placement rate of 68.1% in presentations to investors, when internal audits showed that executives were aware this number was highly inaccurate. The company is accused of paying a temp agency “to place students to meet the accreditation deadline and minimum placement percentage,” along with double-counting some job placements in order to make the school appear to be more successful in the eyes of investors. Current or former CCI students in California who wish to file a complaint can contact the Attorney General’s Office via the AG’s website. Previous Does United Airlines Set Higher Redemption Rates For Customers With More Reward Miles?